Wow! Hi! I can’t believe this is the first comic I’ve put up since coming back from TCAF. I’m hoping this one was worth the wait. TCAF was great, if a little overwhelming! If you’re one of the folks who I gave my card, thanks so much for stopping by the site! I hope you like the things I make. Speaking of things made by people, I have a really cool announcement! Teukie, the artist behind Rowdy Baubles, is giving away one of their beautiful custom sparkly pronoun necklaces to one lucky Riot Nrrd fan! If you have never seen their work, skip over to the etsy, the stuff is amazing. The necklace above is an example – you’ll be able to choose your own pronoun, of course! I’ll also be offering one of my pronoun buttons as a consolation prize to two entrants. You can enter by liking Rowdy Baubles or Riot Nrrd on facebook, or if FB isn’t your scene, by telling us your favorite Rowdy Baubles piece in the comment! I’m partial to the Hufflepuff crest, myself… though all of the sea creature stuff is so dashing, too! MARIA: Hello! I’m home, and craving pizza! You down, Charlie? ...Charlie? MARIA: Aw, Your Excellency. Is there any sweeter way to be greeted than your happy rolly dance? MARIA: Oh. There is that. Gotta say I love the unicorn necklaces. One can never have too many unicorns. Wow, didn’t see that coming! Or Charlie could always do the happy rolly dance himself. I get the feeling Maria wouldn’t mind that. 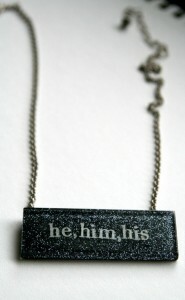 although I’m not sure I’d want a pronoun necklace, now that I think about it, I can never pick one! “answers to anything except it” probably wouldn’t fit on a necklace, huh? I love Charlie’s expression in the final panel! For such a relatively simple art style you manage to communicate so much. Been a lurker on the website for ages now, but would just like to say how much I love it. Thank you for all the amazing work. I’ve been reading Riot Nrrd for a while now and have been utterly suckered in by all of the characters. They are all lovely. Rowdy Baubles is also pretty spiffy. I love all of the etched copper; it is so well done. Though, I think the only thing I would wear from them would be the “they, them, theirs” necklaces. All of the jellyfish earrings are amazing! The octopus pieces are sweet, but I love the ampersand ones. The ampersand is just such an….inclusive character. That octopus necklace! Oh so gorgeous. Still one of my fav moments from this strip.